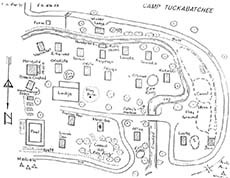 Businesses, Families, Clubs, Organizations and Schools are encouraged to have their picnics, reunions, meetings, and camping trips at CAMP TUCKABATCHEE. Groups must provide own CPR & 1st Aid card holder and provide a list of participants upon arrival at camp. There is a landline for emergencies 815-433-2976. 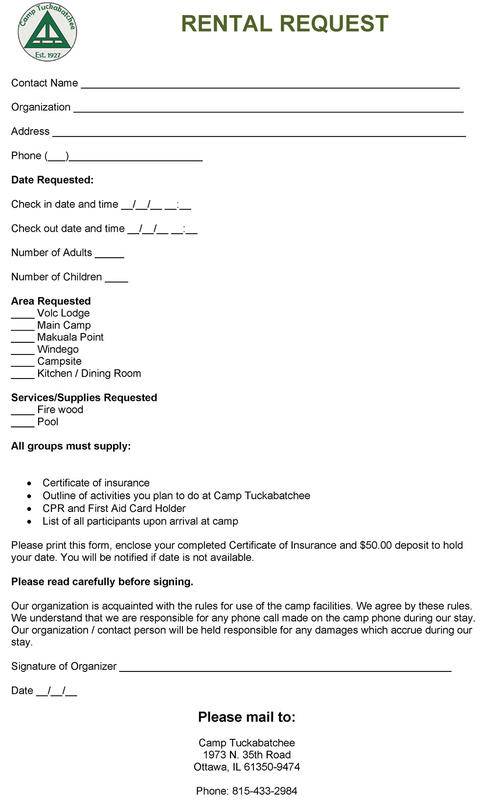 All groups must provide proof of insurance with Camp Tuckabatchee listed as additional insured for a minimum of $500,000.00. Security deposit of $50.00 per 24 hours is required to hold your reservations. *IF YOU WILL NOT BE ARRIVING ON TIME PLEASE NOTIFY THE CAMP BY CALLING 815-433-2984, IF YOU DO NOT REACH A PERSON CALL 815-252-2985. The kitchen is equipped with a oven, microwave and refrigerator. Cabinets hold dishes, glasses, silverware, a variety of utensils and some pans. If you need to use a large pan or skillet, you will need to bring it with you. You will have to bring your own food, dish soap and towels. The rest room is complete with showers as well as toilets and sinks. You need to bring soap, towels and wash cloths. You will have to bring sleeping bags, blankets etc. Mattresses are available. GARBAGE REMOVAL: Take all the garbage to the dumpster. FIRE BUILDING: You will have to bring dry kindling, newspaper, matches and wood. Please build in fireplaces only. Extinguish completely before leaving. Clean out fireplaces before leaving. Place ashes in barrel outside the kitchen door. Close dampers. Wood may be purchased at the camp for $30 a rack. REST ROOM: Please leave the bathrooms as clean as you found them. KITCHEN: Please leave the kitchen as clean as you found them. FLOORS: Both upper and lower levels of the lodge should be swept. ADULT SUPERVISION: Two adults for every 10 children under 18 should accompany a group to camp. Please treat this building with respect and care. Keep it clean for others to use and report any accidental damages promptly. 10 sleeping cabins are available with approximately 12 beds each. There is NO electricity or heat in these cabins. Rest rooms have electricity, flush toilets, sinks and showers. You need to bring soap, towels and washcloths. McAtee Lodge is located in main camp. This lodge features a modern kitchen, dining hall with seating for 100+ with a large stone fireplace. KITCHEN: Please leave clean. Remove all items from the refrigerator. SWEEP: Please sweep all cabins used including the lodge. VEHICLES: No vehicles may cross the bridge. If you are bringing a large amount of supplies, remember to bring help to haul from the parking area. If something is broken report to the office. PLEASE DO NOT attempt to fix it. 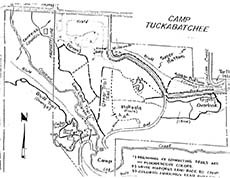 Camp Tuckabatchee has a septic system. PLEASE DO NOT flush anything except toilet paper. Low impact on the environment must be your goal at all times. As you see the camp upon arrival, it must be the was it looks when you leave. 5 Large army tents on wood bases. Each tent will hold 5 adults. Must walk to the site. Large clearing with fire ring. No buildings, rest rooms, water or electricity. Food service - full service or food only: prices vary to menu request.